Two girls get abducted, but the main suspect gets released after 48 hours, since there is a lack of evidence. Keller, one of the fathers decides to use his own methods in order to get a confession. 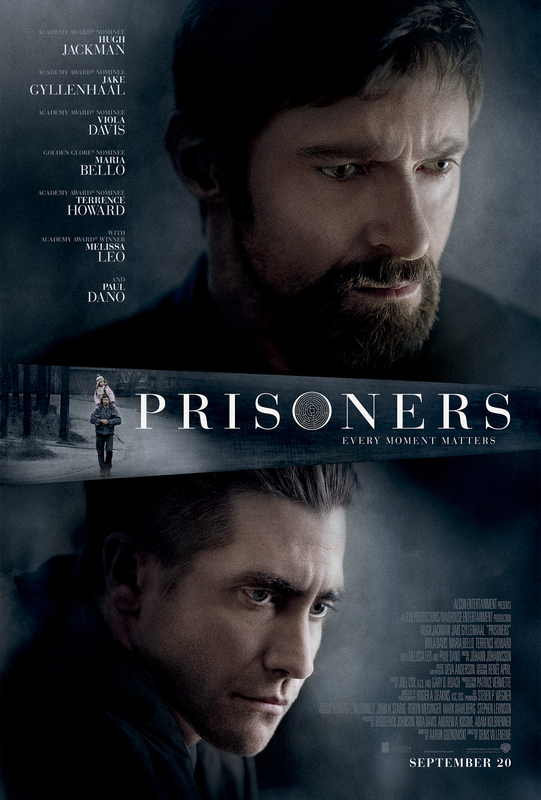 Prisoners is a very dark tale, that takes the viewer to the darker sides of a human mind and soul. And even though the actions Keller uses seem so extreme, I kept wondering how I would react in his situation. And the answer is, I don’t know. Does anyone know? Wouldn’t you do anything it takes to save your child even if you have to hurt someone in order to find her? The camera work is great, the color treatment just as dark as the topic, and they couldn’t have picked a better cast for the movie. I mean, Viola Davis seems to be in every other movie these days, Maria Bello is known for her dramatic roles, and if you know Terrance Howard is in it, it must be a good movie. The two protagonists are very convincing and make you follow them on every step, reliving their every thought and feelings. I have to admit the movie sucked me in from the very beginning, and didn’t let me go until it was over, but I had to check the time every now and then, because it was very very very very very very … long. Not boring, but long. I am not sure if they could have left certain scenes out to make the movie more of a blockbuster length, but then again, I don’t think it was supposed to be the usual blockbuster someone would watch on a Friday night. You have to expect a movie that seems very realistic and makes you think, maybe even after the movie is over. It is hard to watch sometimes and difficult to digest, but if you appreciate a compelling drama with amazing characters, and can bear a depressing atmosphere for 2.5 hours, you shouldn’t miss Prisoners. For me it was definitely worth watching, but it was probably just a one timer. Oh, by the way, when the end credits rolled in I noticed that Mark Wahlberg was the Executive Producer, which impressed me a lot. Obviously he knows what he is doing, and while doing research I noticed this was not his first time producing a movie. Kudos to him! An Article by my blogger-friend Sherryn Daniel: How to be confident like Mindy Kaling: Fake It Til’ You Make It! Well, I think it is actually very depressing. It just basically confirms how sick this world can be. But it was a good movie nonetheless. I haven’t watched the other two movies you mentioned. I guess I will be able to give it a try when it comes on television.